Postwar 54 MM Tri-ang Castle+3 Britains Detail Knights-Elastolin-Lineol-Hausser. 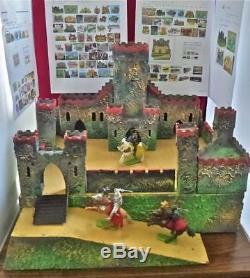 Large Wood/Composition Coated Triang Castle+3 Britains Detail Knights. At one time the Tri-ang firmLines Bros. Made a large assortment of toys to include the Hornby, Meccano and Dinky lines. Postwar the company fell on hard times. Meccano and Dinky were bought by Airfix. A fine example of a 54 MM castle made of wood coated with a composition type material. Hardly any wear to the surfaces of castle and wall/towers. Basic measurements : base is 14 1/2" by 18" and is 4 inches high. There are a total of 12 pieces that make up the components mounted on the base. Each piece has one or more thin spikes that fit into holes in the base. There are 4 fence/wall sections, 3 small towers, a long ramp that is 15 inches long and 3 1/2 inches wide that is simply positioned by hand with no wire posts. Also there is one corner piece, an entrance with a metal draw bridge that can be raised/lowered and an entrance way with two side towers that fits in front of the main castle section. The main castle section is 16 across and is 14' tall at the center. The 3 Dinky knights date from about 1970 and were made in England. They are plastic with metal bases and are 54 mm. Overall in excellent condition for the castle and knights. Just tell me why you don't care for what you bought and you can return it. If , however, a figure is stored under conditions of heat/dampness, the paint can deteriorate. Composition also shrinks over time which causes stress cracks. There is NO connection between the age of these figures and the actual condition of an individual figure. "Some people are in good condition for their age"...... This truism does not apply to German Composition figures... German Composition Scale Reference : A marching figure is measured from the bottom of the base to the top of the helmet. Some variation in height can be expected due to the molding process. Figures, as well as the horses, have the same scale but do measure differently. SCALES : 4.5 cm = 1 49/64 inches tall... 6.0 cm = 2 7/16 inches tall.... 6.5 cm = 2 9/16 inches tall... 7.0 cm 2 3/4 inches tall..
7.5 cm 2 61/64 inches tall... 10.5 cm = 4 9/64 inches tall... Stating that a figure is all original is meaningless unless it is examined under a black light. I check all my figures under a black light and tell you about touch-ups and repairs if any. Also, in most cases, I have the same figure in my collection for further comparison. I clearly describe and back up what I sell. A 7.5 cm(3 inches) marching figure would be 1/24 th scale. A six foot individual would be 3 inches. Since the base is included in the 7.5 cm, this would make a figure about 5'8' and the scale 1/26 th. German Composition is considered to be 1/26 th scale. NOTE: Any questions about this or other figures? Get Supersized Images & Free Image Hosting. Create your brand with Auctiva's. Attention Sellers - Get Templates Image Hosting, Scheduling at Auctiva. The item "Postwar 54 MM Tri-ang Castle+3 Britains Detail Knights-Elastolin-Lineol-Hausser" is in sale since Thursday, August 2, 2018. This item is in the category "Toys & Hobbies\Toy Soldiers\Pre-1970". The seller is "gearsdown" and is located in Woodstock, Illinois. This item can be shipped worldwide.